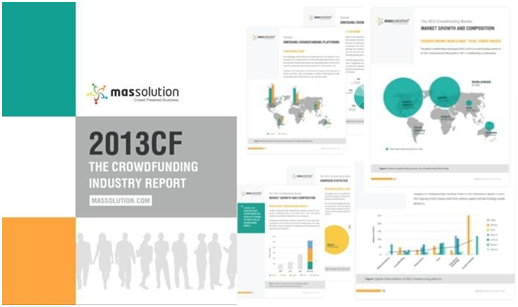 Research firm Massolution released last Monday a crowdfunding industry report based on its research into 582 firms. 2013CF The Crowdfunding Industry Report estimates that crowdfunding sites globally will reach close to $5.1 billion in transactions for 2013, twice the $2.7 billion total for 2012. That data extrapolates to an 81% growth in 2013-12 versus a 64% growth in 2012-11. Right now the spotlight is on LendingClub that offers peer-to-peer loans of up to $33,000. Last month they transacted $125 million with projections to lend up to $1.5 billion by year end. They stand to double in size from 2012 and are considered the behemoth as they are triple the size of the US second runner up Prosper; which has lent $400+ million cummulatively over the last few years. The report concludes that lending-based crowdfunding grew the fastest in the world and combining LendingClub’s $1.5 billion trajectory in 2013 withKickstarter’s 2012 $274 million revenue (the leading reward-based firm in the world had 230% growth in 2012) we could see these two firms hitting north of $2 billion. The crowdfunding industry has arrived and leading financial firms like Asset Alliance are embracing it. We now see more considering it. For more updates on the crowdfunding industry and information on alternative investment events, or if you have comments about this article, you can comment here or reach out to me at David@LDJCapital.com directly. Thank you.